On Sunday 14 February, 84 (Coventry Airport) Squadron celebrated the promotion of Cadet Jake Garrett to rank of Cadet Corporal. He will now take up place on the cadet leadership team at the squadron leading sessions and training younger members of the unit. During final parade, Officer-in-Charge Flying Officer Rosie Chapman requested Cadet Jake Garrett to fall out from the ranks and take up a position at the front. Garrett was then informed that he had been incorrectly dressed all morning and was promptly presented with a set of Corporal rank slides to add to his uniform! It is safe to say that he certainly was very surprised but it has been very well deserved. Garrett started with the Air Cadets back in 2013 and over his time at 84 Squadron has demonstrated a mature attitude to every activity and event he has taken part in, of which there have certainly been quite a few! From a fantastic high attendance record to assisting with community events, taking part in Live Firing shooting days, fieldcraft training andDuke of Edinburgh's award scheme through to representing the Squadron and the Wing at an oversees camp in Cyprus last year. 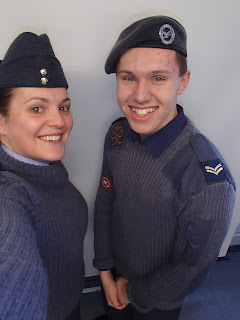 After the parade was dismissed, Corporal Garrett was called for a quick photoshoot and what better way to show off his new rank slides than by taking a selfie with Flying Officer Chapman who was full of praise saying “it is always nice to reward strong and stand-out cadets with the recognition they deserve. I am sure that Corporal Garrett will continue to develop his own skills and experiences as well as be an excellent role-model for newer cadets”.